Often times as an artist inspiration comes from many sources, mine takes root from a fascination of railroads, geography, architecture and history. With consideration of the Main Line Project there came another major source of inspiration: the photographic work of William H. Rau. No. 6 Bridge from Deep Cut, Pittsburgh Division. Image from Rau's 1891 commission showing the fresh re-construction of the main line through the Conemaugh River Valley that was decimated by tragic floods just three years before. William H. Rau photograph, Collection of American Premier Underwriters, Inc.
Born in 1855, Rau was a Philadelphia based commercial photographer whose relationship with the Pennsylvania Railroad spanned his career in the business. Though he had numerous assignments with the railroad over the years, it would be two commissions that brought Rau to our attention in the 20th Century. The first assignment was from June to September 1891, the second, April to July of 1893. The commission employed the relatively new concept of advertising photography to entice the leisure traveler to explore the American landscape by way of the Pennsylvania Railroad. Illustrating the terrain and destinations along the system, Rau worked with a mammoth plate view camera in the field, traveling in a customized passenger coach complete with living quarters and darkroom. (L) William H. Rau portrait circa 1908. (R) Rau and his assistants setting up his camera along the Conemaugh River at the Packsaddle near present day Torrance, Pennsylvania, circa 1891. Both images collection of the Library Company of Philadelphia. In 2002 the Library Company of Philadelphia mounted an exhibition of original prints by Rau from the 1890’s commissions in conjunction with the release of a companion book titled “Travelling the Pennsylvania Railroad” published by University of Penn Press. The exhibition hit home with me for many reasons, providing not only a view of the Pennsylvania Railroad over 100 years ago but by also appealing to my photographic sensibility. Like Rau I was using the view camera to craft thoughtful, creative and technically resolved images that can function on both a documentary and artistic level. Rau’s mammoth plate images provided insight for an approach to photographing not just the trains but also the infrastructure of a railroad and the landscape it traversed. This exhibition and subsequent book was the seed that would germinate into the Main Line Project some five years later. View southeast from the Rankin Bridge of the Mon Line and Union Railroad interchange, Kennywood, Pennsylvania. One of many images made during the initial development of the Main Line Project draws from Rau's use of the landscape for context and the often wide and elevated views common in his imagery. In 2006, having been out college more than five years, I was making work and exhibiting as much as possible. I had finished a two-year Career Development Fellowship with the Philadelphia based Center for Emerging Visual Artists and was teaching at Drexel University. My projects focused on the Delaware River Watershed and later documenting historic but obsolete structures in and around the Philadelphia area. Though I was having a fair amount of success with the work, I couldn’t help but think more about Rau’s PRR commissions. Using his work as a starting point could provide insight on how to revisit the very subject that led me to pick up a camera in the first place – the railroad. 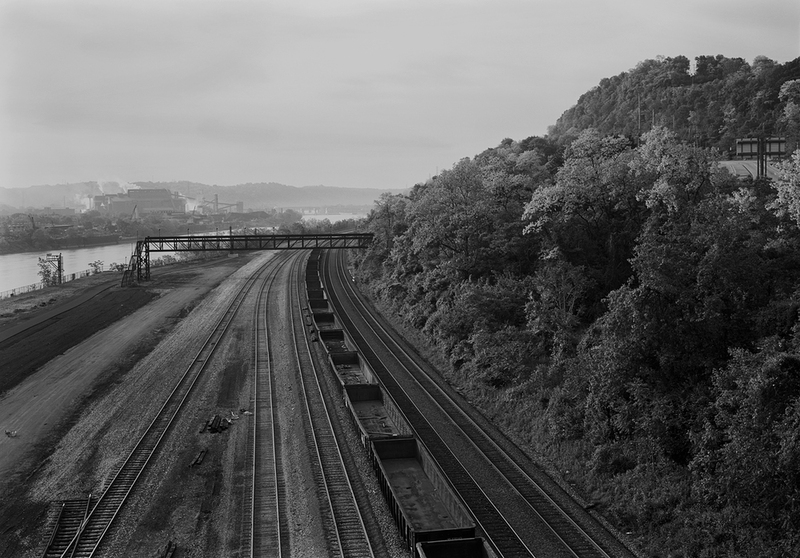 In the spring of 2007 I applied for and received an Alumni Travel Grant with the Center for Emerging Visual Artists to photograph the surviving railroad and landscape along the former PRR between Harrisburg and Pittsburgh, the segment I was most familiar with. With the Rau book always by my side I made several trips building the conceptual framework of the project. Drawing from approaches utilized in past work, I photographed everything along the route, compiling an assortment of over a hundred images that ran the gamut, some good, some bad; others that became the cornerstones of how the project would evolve. Between trips I contacted the Library Company to inquire about viewing the Rau Collection for further inspiration. Knowing that the book reproduced 50 plates from a larger collection of 463 individual images I could tell just by the published inventory list that I needed to see more. With the help of the Library Company’s prints and photographs curator Sarah Weatherwax, I began reviewing small reference prints and later original 18x22” contact prints. There was something magical about looking at this work in person, to be able to hold and interact with it minus the glass and polish of an exhibition. Seeing the sheen of vintage albumen prints and the endless amounts of detail from an image made from a negative of the same size was a true sensory experience. It was a first hand view of a historical photographic process, a cohesive collection of how one photographer viewed the world and the landscape that was in front of his lens. Though this project was never meant to be a re-photographic survey sometimes the opportunity presents itself to study the 120+ years of change on the Pennsylvania Railroad like here at Jacks Narrows on the Middle Division. Left image by the author, right image by William H. Rau, Collection of American Premier Underwriters, Inc. Though Rau’s work was playing a big part in molding my project I did not want this to become a re-photographic survey, getting mired down in finding the exact locations and times Rau made pictures. Instead my relationship with Rau was an open dialogue, one that takes influence from the imagery while considering the modern landscape and rail corridor. Recognizing that Rau was commissioned to make this work, for me it was much bigger than just an assignment. I was working to discover the history tied to a railroad corridor that has largely shaped the landscape throughout the Northeast and the Commonwealth of Pennsylvania - about using Rau’s work to inspire and inform me of a past time in the landscape and on the railroad. The act of gleaning information from Rau’s images added yet another layer of depth in my relationship to his work. Different views made by Rau throughout his commissions with the PRR show the great systemwide improvements that were taking place while also acknowledging previous modes of transportation that gave way to the railroads. (L) Trimmers Rock (looking east) showing both the Juniata River and relics of Main Line of Public Works canal. (R) McKeesport and Bessemer Railroad Bridge reveals fresh masonry work and construction debris of this new bridge constructed to connect with mills in McKeesport from the West Mifflin / Duquesne area. William H. Rau photographs, Collection of American Premier Underwriters, Inc.
Around this time I began working with Amtrak’s engineering department and historic architect John Bowie Associates who were in the midst of documenting various historical facilities along the Northeast Corridor. It was the relationships that developed during this phase (which continue today) that helped me better understand more of the physical and economic history of the PRR and appreciate just how pivotal this era was to the company. Rau’s images reveal an evolution: a railroad building a physical plant that would be worthy of the claim of being the Standard Railroad of the World. In the 1890’s massive system wide improvements were well underway that would include construction of the countless stone bridges that remain today among other large scale engineering projects. At the same time the photos give a nod to antiquity, the relics of street running and canals that were giving way to a grade separated four track main line that stretched from New York City to Pittsburgh. Rau’s imagery provided a comprehensive study of a railroad about to hit its prime and a landscape that would see continual transformation because of its presence. The ability to gain such a clear perspective of the PRR in one cohesive body of work afforded the visual “before” to my after. Understanding the history of this great railroad in conjunction with the aesthetical response to Rau’s photos provide a sort of spiritual guidance in making images for the Main Line Project. Inspired in different ways by his work I consider channeling my inner Rau every time I pick up a camera and look to a subject like the former Pennsylvania Railroad.